Soft Cover, 384 pages, 5.5 x 8.5. New Brewing Lager Beer has been completely revised and expanded to include more on craftbrewing techniques and more information specific to ale brewing. Author Greg Noonan, one of the best-known craftbrewers in America, guides you through an advanced discussion on how to produce high-quality beer every time you brew. This advanced all-grain reference book is recommended for intermediate, advanced, and professional small-scale brewers. 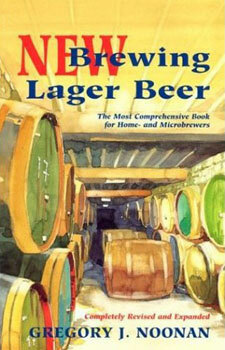 New Brewing Lager Beer should be part of every serious brewers library. Greg Noonan, owner and brewmaster at the Vermont Pub and Brewery and founder of the Seven Barrel Brewery, is also author of Scotch Ale, the eighth title in Brewers Publications' Classic Beer Style Series.